My birthday has always been a big, happy celebration for me. When I was younger, the celebration wasn't just on my birthday, but during the whole month of June. As I got a little older, that got reduced down to about a week. And now I think I've hit the age where just the weekend is plenty. I'll admit it. I LOVE getting gifts. I do. It's that element of surprise just before opening the package. That, and the fact that someone was so kind to do something out of the ordinary for me. As I've gotten older, I think of gifts of the panacea to getting older.... Yes, I may be another year older, but someone has given me a prize for getting there! Fermin always gets me a thoughtful gift. Any other gift I get is just icing on the proverbial birthday cake. Last nights delicious frosting on my birthday eve's eve cake was given to me by our friends Sammy and Lindsey. A bottle of wine (not pictured because we drank it immediately! 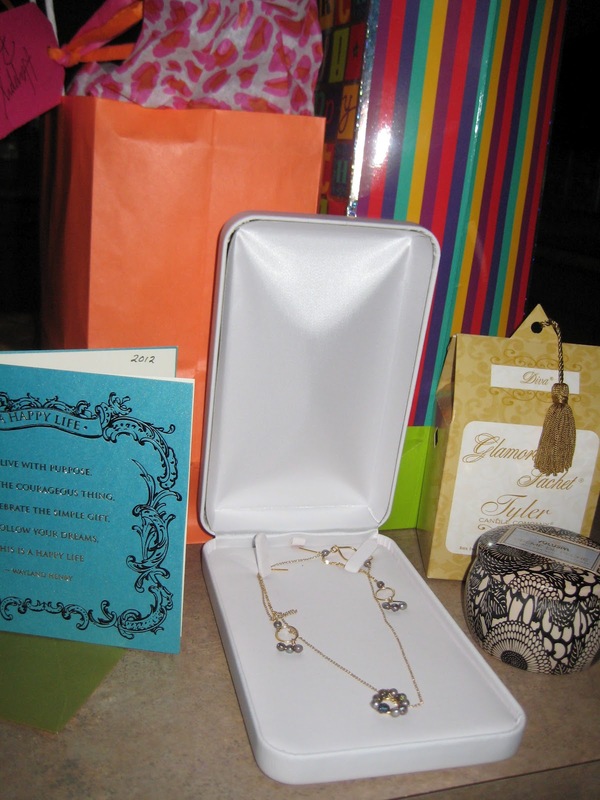 ), some yummy candles, sachets for my sheets!, and a really beautiful necklace with earrings that Lindsey made!!! Oh. My Gosh. I was really surprised- And happy! Because like I already admitted: I LOVE GIFTS. Then, Ricky went on an hour long walk with me on the Katy Trail. It was really hot by the time we got back to the car and he was exhausted. He's tired, but he'd do it all again for me! 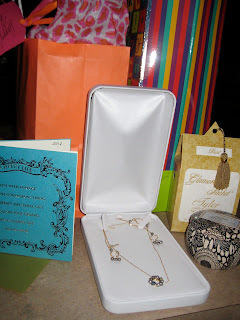 My birthday isn't even until tomorrow, but already, I've received such amazing gifts and I feel so well cared for. Although I don't love the getting older part that a birthday brings, I will always love the celebration!